Illustrated visuals for IPad game designed to help Occupational Therapists incorporate physical therapy in a fun way. The game are design to help with small motor function and hand coordination by dragging, pinching and tracing. The client wanted the main character to be based off her actual poodle Shelby and the landscape to be the reminiscent of the Pacific Northwest so I dew my inspiration from there as well as the company's "Doodle Therapy name. Made using Wacom Tablet in Photoshop. Look in Logos and Interactive Design for more with this brand. Large scale illustrated panels for non-profit conference. The Puyallup Watershed Initiative is a collective of interest groups banned together to look out for the water systems in the southern Puget Sound area and the communities affected. 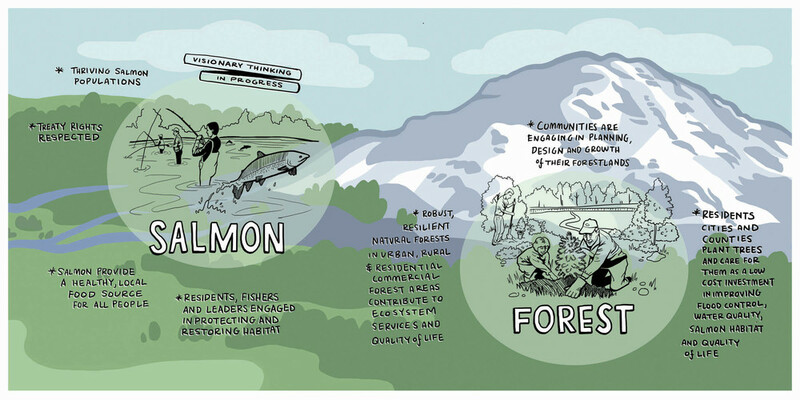 These panels were commissioned for a conference between the groups in June 2014, intended to map out their vision and nail down their points of focus. 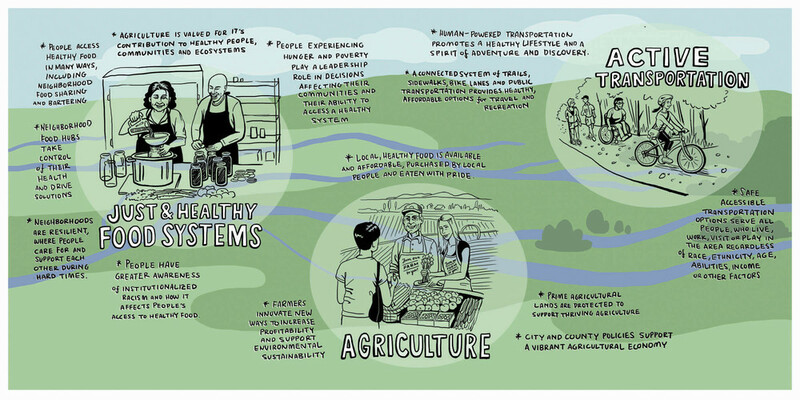 They wanted an illustration for each interest group surrounded by that group's goals, juxtaposed with an image of the span of the watershed that brings them together, and they liked the idea od it all feeling hand-drawn. These would be large enough they would fill the front wall and groups could gather in front of them to discuss. The final 5 panels were each 5ft by 4ft and printed on vinyl to be hung on the conference room walls. They also wanted a poster size image for print and web use which you can see in the smaller image with no bullet points. Commissioned art depicting client's Husky dog, Roxy, in the style of Shelby's Quest art. Made using Wacom Tablet in Photoshop. Wedding Invitation for couple that wanted a poster-like design with Fremont "Center of the Universe" theme. Illustration inspire by 50's advertisements and science guides. Color scheme inspired by couple's wedding theme colors. Made using Wacom Tablet in Photoshop over hand-drawn sketch. For more about this project go to Invites section. Album art design and illustration for Pepper Proud, a Seattle based folk musician from West Virginia, who wanted to emphasis in this debut album the journey the songs represent for her. To bring in this theme, the cover illustration features the artist entering a path and the back titles are wound into a flowing path. The style is meant to feel very natural and hand-crafted, yet beautiful and elegant. Made using Wacom Tablet in Photoshop over hand-drawn sketch. For more projects with this brand see music design and logos. The client, an acid reflex medication called Protexid, wanted an illustration that would show customers what the health problem looked like that their product helped. They needed it to be clear, descriptive and accurate, yet not disgusting to look at. My solution was this vector base illustration that explained what was happening in a reaistic way but in a cartoonish enough style that it was easy, even pleasant to look at. For more about this product and to see the illustration in use go to the Protexid website.